After Saturday's bake-a-thon making rolls for the week and fresh Hotteok for snacks, I got to thinking. That's always dangerous, but it occurred to me that if you sometimes can scale up a recipe, can you scale it down? The short answer is sometimes, Yes. My sister Pat's Pizza Dough Recipe is one that I use frequently for all sorts of bizarre things including baguettes, dinner rolls, burger buns, boule, and even sometimes, Pizza. 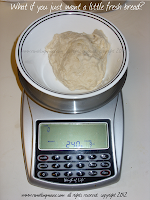 The challenge was just how small and simple can I reduce the recipe to make a perfect bit of bread. The answer was I was able to make three sandwich sized rolls out of the result. It would make two Hoagie rolls from just this amount. The other thing - if you don't have a bread machine or don't know much about making bread, this is a small and non-threatening recipe. Why non-threatening? I mixed the entire amount in a two quart bowl. Yes, about the size of an average saucepan. If you have a "regular" sized non stick saucepan, it will make it even easier. You may need to add a little extra water to get just the right dough consistency. I used 3 ounces when I did this and it was a little loose. I ended up adding a little extra flour to balance things out. Mix all of this in your bowl by hand. It should go together easily. I used my hands, literally, and played with it like play-doh. When smooth, divide into rolls, baguettes, or into a bread pan. 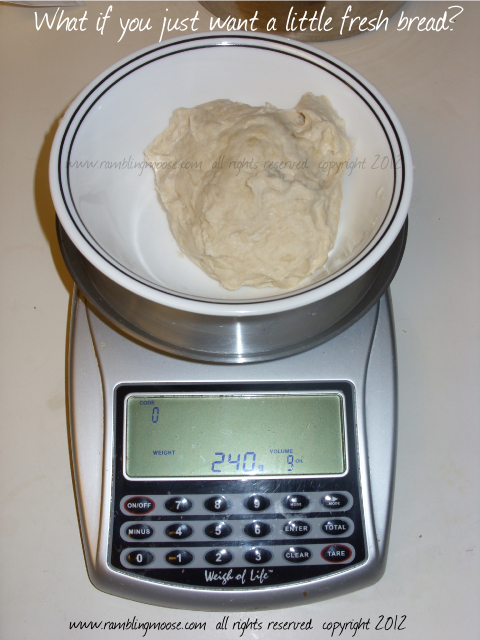 Allow to rise for 2 to 4 hours (or more) or until it doubles in size. Bake at 450F and check at 9 minutes for proper done-ness and a good hollow thump on the bread. It may go longer or shorter depending on how hot your oven runs.